She fought hard on the ball, never backing down, never giving in. She set up her teammates with perfect passes and always knew where to be when they set her up on a run. She played with confidence and composure. 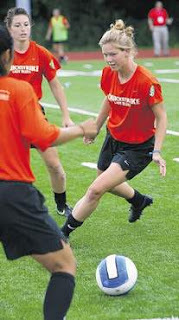 Striker Whitney Palmer figured the Hudson Valley Quickstrike Lady Blues' latest signee was another star Division I college player. She was wrong: Abby Carr is a 16-year-old who won't graduate from Miami Springs (Fla.) High School until December. "I didn't believe them when they told me that she was 16," said Palmer, entering her junior year at the University of Oklahoma. "When she came out to practice, she wasn't afraid, she knows she can come out on the pitch and play at any level." -Read the entire article from the Times Herald-Record, "serving New York's Hudson Valley and the Catskills." Nice article. Congratulations to Abby!